Top baseball players of Japan and the United States will showcase dream games in Japan this autumn for the first time since 2006. Japan’s all-star team, dubbed Samurai Japan, and the MLB All-Stars are scheduled to play five games between Nov. 12 and 18 at Kyocera Dome Osaka, Tokyo Dome and Sapporo Dome, it was announced Tuesday by Nippon Professional Baseball, Major League Baseball (MLB), and MLB Player Association and The Yomiuri Shimbun. To mark the 80th anniversary of the establishment of Japan’s professional baseball, the joint team of the Hanshin Tigers and the Yomiuri Giants will have a game against the MLB All-Stars at Koshien Stadium on Nov. 11. 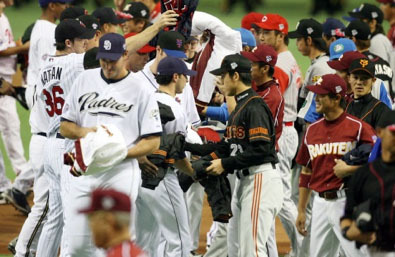 On Nov. 20, Samurai Japan will have an exhibition game against the major leaguers at Okinawa Cellular Stadium in Naha. Players will be announced in July, or later. Hiroki Kokubo will lead Samurai Japan as the national team’s manager.